Let's start by identifying what a Island Cluster Reversals are. You may be familiar with the term "island reversal" - which is where a gap forms or a chart at the top or bottom of a trend, on either side of the reversal day. Well the Island Cluster Reversal price chart pattern is an extension of this. Let's take a look at one. Here we can readily observe the typical pattern. 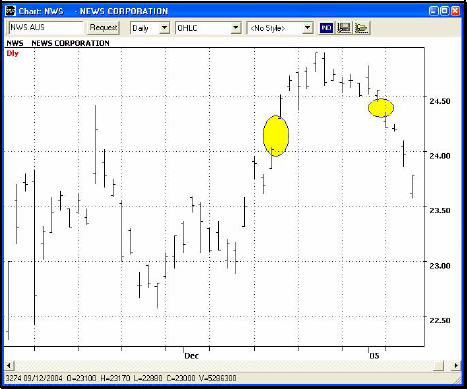 We can see a gap on the way into the pattern, followed by another one on the way out (highlighted in yellow). Between these two gaps we find the price action consolidating within a range before the breakout occurs. This pattern can be found either at the top or bottom of a move. Here's an example of the island cluster reversal, but this time at the bottom of a move. Looking at the above two examples, we should note something important. The number of days that form the cluster can and do vary from pattern to pattern. 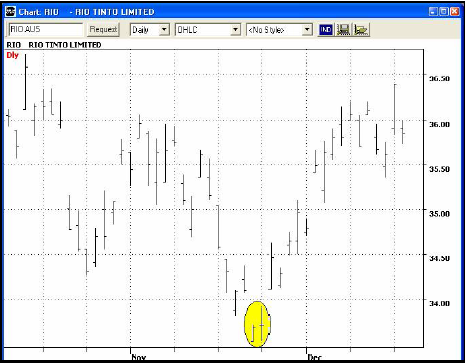 The first pattern had 12 trading days between the gaps wherease the second had only two. The point is, that as long as more than one trading day is involved, the pattern can be called an island cluster reversal and not simply and "island reversal". The psychology behind this pattern tells us that the underlying security has come to a point where it makes a last ditch effort to thrust the price higher (or lower) but at this point, has run out of steam, so that now market sentiment is changing about it while the cluster develops. One thing to look out for, is more volume for the security at the start of the pattern (directly after the first gap) and then this volume begins to fall away as the consolidation process continues. The fall in volume is mostly due to the buyers losing their conviction that the security will produce a profit, while other traders are sitting on the sidelines waiting for the new direction to be established, or price volatility to return. The Relative Strength Index (RSI) can be a useful ally when identifying island cluster reversals, as it identifies internal weakness in a trend. Here's an example of that in the chart below. 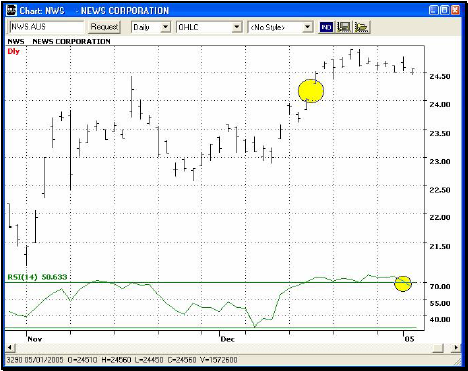 Notice in the above image, how the RSI is indicating internal weakness in the stock priced action with a very strong bearish bias signal, at the same time as priced is consolidating in the cluster. For the RSI to come from the "over bought" zone and breach the 70 signal line indicates that the stock trend is losing internal strength. Even so, we don't have an entry signal yet. We are still waiting for the island cluster reversal pattern to be confirmed first. The validation for this pattern is not given until the stock has produced a price gap in the opposite direction after the consolidation period, accompanied by an increase in volume for that particular trading day. Patience will be needed to wait for this outcome. To further stack the odds in our favor, it is worth looking at what the Bollinger Bands and CStats are telling us. 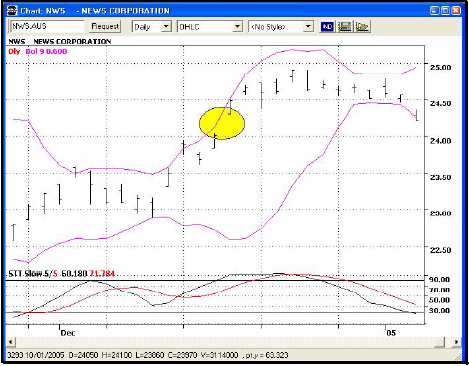 The example below shows the Bollinger Bands flaring open on the validation breakout day. We also notice that the CStats (Stochastics) are showing weakness, as the stock has only slightly dropped and the CStats have gone from their over bought zone to almost their over sold zone. Another validation for short term traders would be a crossover between the 3 and 9 day exponential moving average at the breakout day. Assuming we are looking at the above chart, here's how you could use this information to profit from option trades. We believe the price action in this case will reverse and continue to fall. 1. 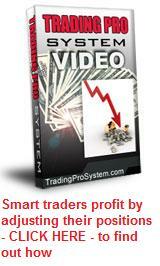 Buy put options with at least 4-6 weeks until expiration date. Be aware of implied volatility. 3. Use a call option credit spread - much less risk than the above two, but lower return on investment. Again, be aware of any implied volatilty issues in each leg of the spread.